It is 134 nautical miles from Montreal to Quebec City. As Dave & Judy on Sir Tugley Blue are waiting in Montreal to finalize shipping arrangements for their replacement injection moulded hull for their dinghy, we and Wings decided to proceed to Quebec City at a leisurely pace. Our first leg was to the Sorel Islands, just east of Sorel, to anchor for a few days. Montreal is a very busy commercial port with ship traffic from around the world. 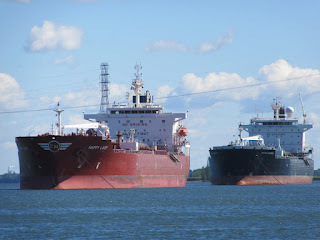 Some ships will carry on past Montreal and on up the Seaway, possibly as far as Lake Superior. 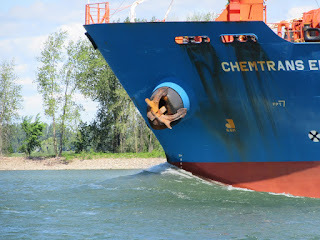 Other ships are too large for the Seaway locks and offload at Montreal to other ships, trains or trucks. For us, this meant seeing many ships along our route to Quebec City. We typically travel along at 7.5 knots (nautical miles per hour) and with the favourable current of the St. Lawrence, we’ll average about 9.5 knots. The commercial ships travel around 12 to 16 knots, substantially faster than us. As a result, we get to see ships going both ways, which we found very exciting. On the first leg, we saw about 18 ships, all going upstream. The majority were sitting very high out of the water, indicating they were empty and heading to Montreal or beyond to pick up a load, presumably for export (Go Canada Go!). Modern ships have a large bulbous underwater bow, making their passage through the water more efficient. 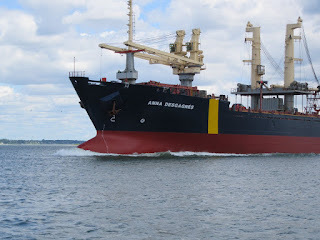 When a ship is empty, the bow looks so impressive and it also throws quite a wake. Even five miles after passing a ship, we were still bouncing up and down in their wake. To me, these ships look so elegant, purposeful and precise (which is good because the channel can get VERY narrow). When passing, these ships command the upmost respect and we give them as wide a birth as we possibly can. Where depths allow, we move outside the channel for maximum safety. When a ship overtakes and passes you, it can take quite a while from when you first spot them to when they pass. 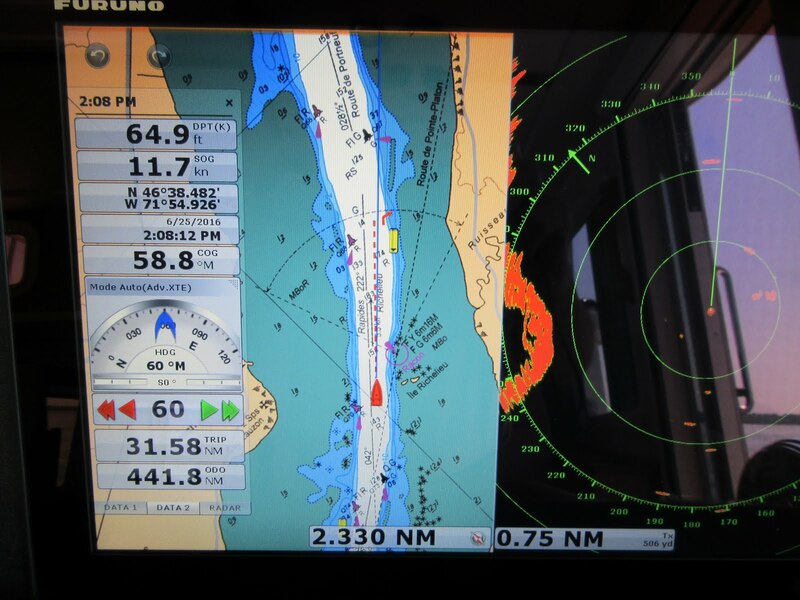 Radar helps you keep track of a passing ship as it approaches you from behind. You can have your radar “track” the ship, telling you its speed over the ground and when it will reach you, so you can be prepared for its passing. Sorel is on the south shore of the St Lawrence at the confluence of the Richelieu River and the St. Lawrence Rivers. Sorel is Canada’s 4th oldest city, being founded in 1642. It is primarily a steel and metallurgy economy. Interestingly, the Christmas Tree made its first appearance in North America at Sorel on Christmas Eve in 1781. Also, NHL star Marc-Andre Fleury (Pittsburg Penguins) was born in Sorel. Sorel however, is NOT the home of the world famous winter boots. They were introduced by Kaufman Footwear in Kitchener and the Sorel boot line is now owned by Columbia Sportswear. While anchored in the Sorel Islands Tuesday to Friday morning, it was very quiet until the Thursday afternoon when suddenly boat traffic started to pick up. Friday June 24th is of course St.-Jean-Baptiste day and a long weekend for Quebecers and it is locally called “The National Holiday of Quebec”. It is the celebration of the fest of the Nativity of St. John the Baptist. June 24th is also celebrated as a festival of French Canadian Culture, both in Quebec and other Canadian provinces and in the USA. In Quebec there are celebrations across the province in most communities. 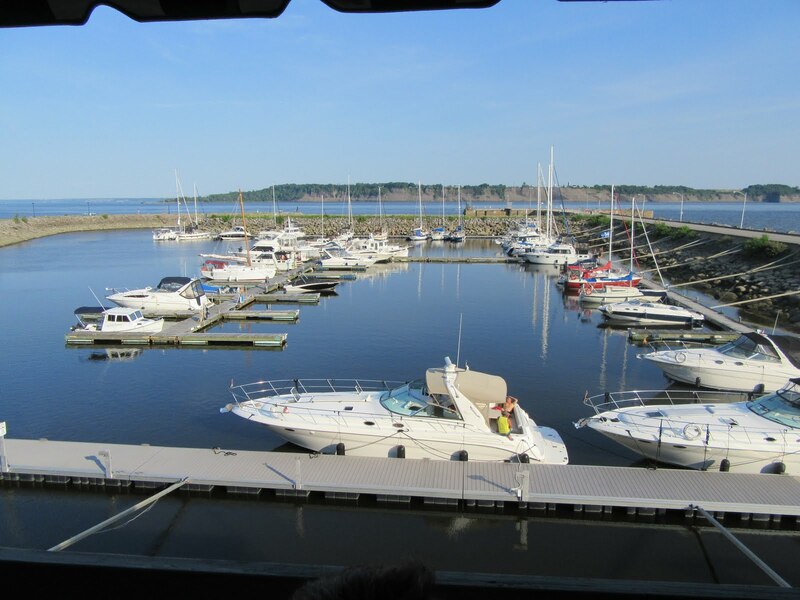 Our second leg from Montreal to Quebec took us to Trois-Rivieres, another commercial port on the St. Lawrence. 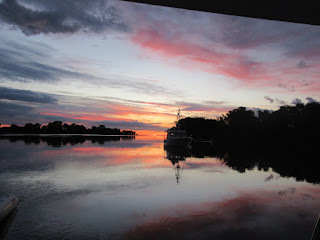 It is named after the Saint-Maurice River, which splits into three “rivers” by a cluster of small islands at its mouth. 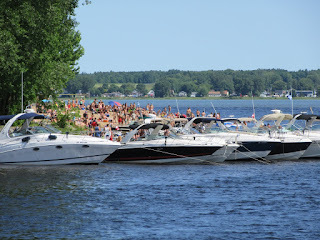 We decided to anchor in the west branch near a popular beach where dozens & dozens of boats gathered to enjoy the sun and the beach on the holiday Friday. It proved very entertaining to boat watch and people watch while large ships silently headed up and down the St Lawrence in the distance. Technically, we are now in tidal waters. The tidal range is only about 6”, so you don’t even notice it, but a lot more is coming very soon. 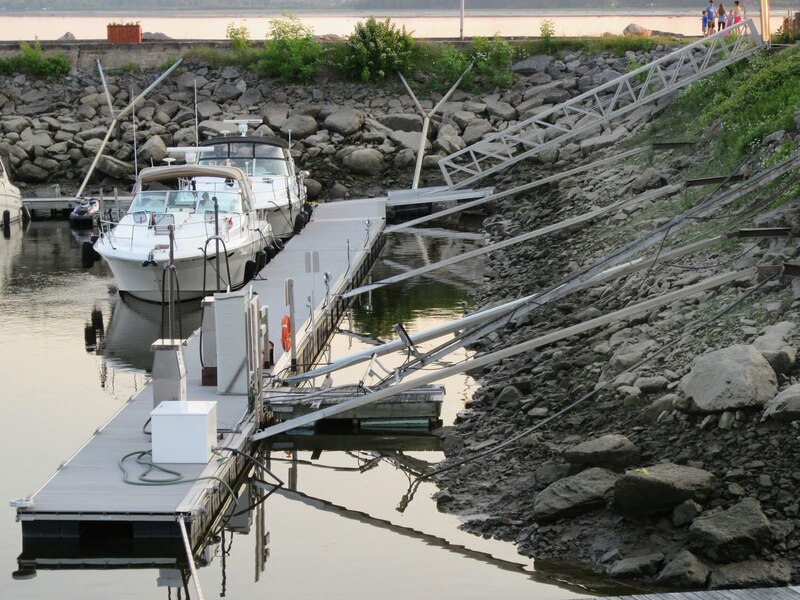 We’ve been busy reading up on flood tide, ebb tide, stand, slack tide, tidal currents, tide tables, “playing the tide” on the St. Lawrence to optimize your passage. It is now Saturday, June 25th and today we’ll enter an area with a tidal range of about 10’. We will also pass through the Richelieu Rapids, an area that gets special mention in our Down East Circle Route cruising guide as during flood tide you can have a 5 1/2 knot current against our down bound travel and during ebb tide, you can have up to 8 knots of combined tidal + river current in our down bound travel. 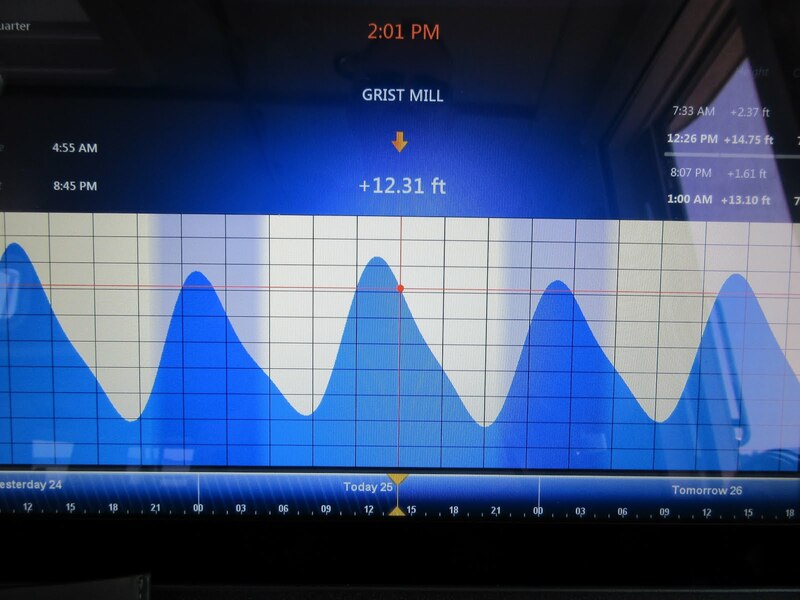 Our normal cruising speed is 7.5 knots, so these are rather significant currents to take into account while piloting our 14 ton boat (at least we think so anyway). After consulting the tide tables for our Trois-Riviere to Portneuf 34 nautical mile transit, we decided to depart so we’d arrive at the Richelieu Rapids just after high tide to ensure a favourable run down the rapids. With great anticipation we headed off. You could immediately tell we are getting into high boating season. There was more boat traffic today than we’ve so far on this journey. The sun shone brightly in a cloudless sky with a very light breeze and fishermen, sailboats, speedboats and cruisers were everywhere, moving up and down the channel. For part of the journey, there was a very light river current. Then, as we approached the Richelieu Rapids, our speed began to pick up. Eight knots, then nine, ten, eleven, peaking out at 11.9 knots, suggesting we went through the rapids with about 4 1/2 knots of current. The channel narrows to about 0.25 miles wide in this section, which is the cause of the higher speed of the current. At high tide the channel looks much wider, but at low tide, there are prominent rocks showing on each side of the channel. Portneuf is directly off the channel at the bottom of the Richelieu Rapids and as you turn to head into the harbour you are going sideways at about the same speed you are going forward, which looks quite dramatic. After docking, we chatted with Bob and Jan on Wings, feeling quite proud of ourselves and our first transit through significant tides. There will be a lot more to come. Portneuf has an attractive and well protected little harbour, launch ramp and park. 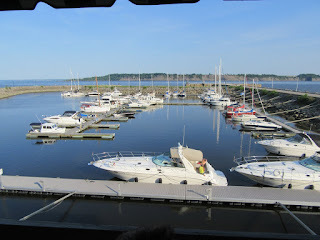 Above the marina office is a lovely little restaurant we’d read about called La Pearle du St Laurent. 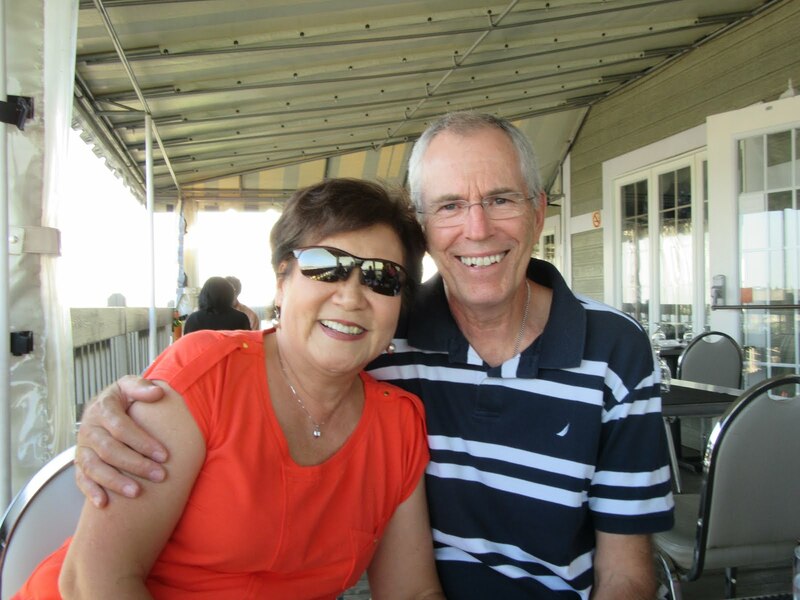 It has a magnificent view of the harbour and the St. Lawrence River and we enjoyed a fantastic dinner while soaking up the view.